Oh yes one would easily think. Hitting the road with a engine displacement of 10,4 litre is something. But wait, this is a 1 cylinder 30Hp petrol engine pushing you to the amazing speed of 21,6 kmh at 6`th gear. Ever heard of Lanz ELI Buldogg roadgoing tractor? They are rare as hens theets, I once had one but now I`ve only got its spare spark plug left, its BIG. 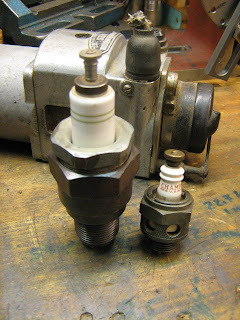 Right Harley spark plug, left is BOSCH`s giant sparkplug for 10,4 litre Lantz engine.